Sweet Potatoes are used in both sweet and savory dishes. But like the pumpkin, I prefer to use sweet potatoes in desserts. 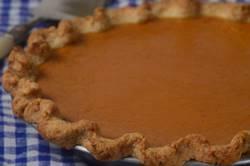 One of my favorites is a Sweet Potato Pie. This Southern classic is a very popular Thanksgiving dessert. It's a single crust pie that is filled with a smooth and creamy custard-like filling made with homemade sweet potato puree, eggs, cream, sugar, and spices (cinnamon, ginger, and nutmeg). Excellent on its own, but delicious with softly whipped cream or even Marshmallow Fluff. This is considered a "soft" pie because it's made with an unbaked crust and uncooked filling that is baked until the crust has browned and the filling has set. I like to sprinkle the unbaked pastry crust with finely chopped pecans (can also use walnuts or hazelnuts) as it adds a buttery caramel flavor plus prevents the crust from becoming soggy. Sweet Potatoes are a Winter Squash. There are different varieties, but I like to use the darker skinned variety (often called Yams) that has a sweet, mild flavored bright orange flesh. To make Sweet Potato Puree, we bake the potatoes in the oven until their flesh becomes soft and tender. Once the flesh has cooled, it is pureed until smooth. You can use the puree right away or it can be covered and stored in the refrigerator for about three to five days. The main problem people can have with custard pies is that the filling has a tendency to crack. There are a few things we can do to minimize the amount of cracking. One, do not over mix the ingredients. I find it best to mix the ingredients together by hand, not in a mixer or food processor. Second, do not over bake the pie. Remove the pie from the oven when it is just set (the center of the pie will still look a little wet), and a knife inserted about 1 inch (2.5 cm) from the side of the pan comes out almost clean. Sweet Potato Puree: Preheat your oven to 400 degrees F (200 degrees C). Line a baking sheet with foil or parchment paper. Rinse and dry the sweet potatoes. Using a sharp knife, cut 1/4 inch (.5 cm) deep "X" into each side of the sweet potatoes. Place the potatoes on the baking sheet and bake until the flesh is tender when pierced with the tines of a fork or the tip of your knife (about 45 - 60 minutes depending on the size of your potatoes). Remove from oven and let cool completely on a wire rack. Then cut the potatoes in half and scoop out the flesh with a spoon. You can puree in your food processor until smooth or mash with a fork. If not using straight away, cover and refrigerate the puree for about three to five days. You need 2 cups (425 grams) of Sweet Potato Puree for the pie filling. Pie Crust: In your food processor, place the flour, salt, and sugar and process until combined. Add the butter and process until the mixture resembles coarse meal (about 10 seconds). Sprinkle about 2 - 3 tablespoons of water over the flour mixture and process just until the dough holds together when pinched. (You don't want a solid ball of dough.) If necessary, add more water. Turn your dough onto your work surface, gather it into a ball, and flatten into a disk. Cover with plastic wrap and refrigerate for about one hour or until firm. This will chill the butter and relax the gluten in the flour. After the dough has chilled sufficiently, remove from the fridge and place on a lightly floured surface. Roll the pastry into a 12 inch (30 cm) circle. (To prevent the pastry from sticking to the counter and to ensure uniform thickness, keep lifting up and turning the pastry a quarter turn as you roll (always roll from the center of the pastry outwards).) Loosely roll the pastry around your rolling pin and transfer to a 9 inch (23 cm) pie pan. Brush off any excess flour and trim the edges of the pastry to fit the pie pan. Crimp the edges. If desired, press the crushed gingersnap cookie crumbs evenly onto the bottom and up the sides of the unbaked pie crust. Cover with plastic wrap and place in the refrigerator to chill, while you make the filling. Preheat your oven to 375 degrees F (190 degrees C) and place rack in bottom third of the oven. Place the baked pie on a wire rack to cool. Serve at room temperature with maple whipped cream. Store any leftovers at room temperature about two days or in the refrigerator for three to four days. Maple Whipped Cream: Place the heavy whipping cream and maple syrup in bowl of your electric mixer. With the whisk attachment, whip the cream until soft peaks form.